Out to my garden in the early evening, just after the irrigation system stops its soft spray. The hammering and drilling noises coming from next door where the neighbour is rebuilding his deck have thankfully ended for the night. Children play in a yard nearby, their voices rising and falling, a sprinkler ticks rapidly, and indistinct hum voices hum from a distant patio, punctuated by bursts of laughter. Butterflies and bees drone lazily. Early summer pleasures. Among them, lavender. I've harvested several bunches for sachets, but left some plants alone to enjoy. Summer evenings are full of loveliness. I hope that you, too, are enjoying the pleasures of summer. Joining with Mary for Mosaic Monday. 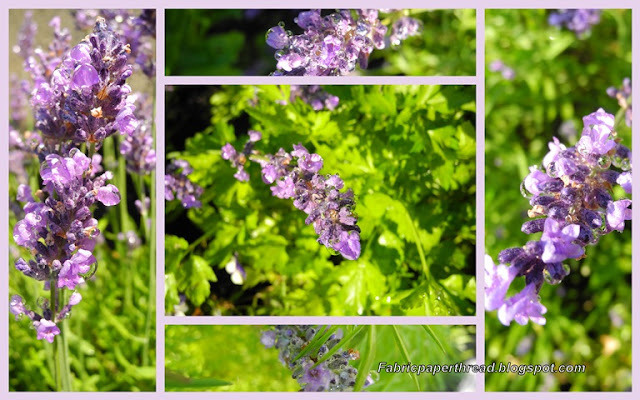 I love the scent of lavender, pretty images! Have a happy week! Beautiful. I love the look and scent of lavender! I'm going to try to schedule a trip to a local lavender farm soon! A favourite plant and I love the scent. Unfortunately mine is a soggy mess on the ground from heavy rains. This just reminds me to harvest mine too. Love your photo! The fragrance of lavender is a wonderful thing. On occasion, I've tucked a sprig inside my pillowcase. I think I`d better learn how to make sachets! Oh my goodness! Your mosaics brought back so many memories of a few childhood years in Maine. My father was in the Coast Guard and we were stationed in Rockland, Maine. Right outside my bedroom window was a huge lavender "tree". The smell was fabulous. I wish they would grow on the Mississippi Gulf Coast, but I think we have too hot a climate for them. I am your newest follower and am visiting from Mosaic Monday. Have a wonderful week and I hope your get a chance to visit me at Still Woods Farmhouse. I posted my first ever mosaic/collage today! It's such a beautiful time of year. I love to water the plants in the morning and catch the scent of the lavender and rosemary. A very pretty lavender mosaic. the sounds of Summer are not very pleasant this morning - roofers working next door. Thanks for stopping by. Yes, when the geranium died back last Fall, I never got around to pulling the dead plant out, then when I got ready to plant some annuals this Spring I saw a bit of green, gave it a shot of miracle grow and it came back. Just got lucky on that one I guess, because they normally don't survive. You have me singing the song! I'm enjoying the scent of lavender over here as well...though I'm sure mine doesn't look as pretty as your picture. As much as I love lavender, I've never tried to grow it! I really should! Enjoy your week my friend! So beautiful! They look wonderful in the garden! The sweet sounds of summer - add in a small plane buzzing in the distance - perfection. I love the happy sounds of summer. Your lavender is gorgeous. Need to harvest some of my Lavenders too. First thing in the morning is supposed to be the best time.